Thought taxes in New York City couldn’t get any higher? Think again. The Pied-a-terre tax is back on the docket, and it has recently gotten some major support that pushed it further along than what it was last a topic of discussion in 2014. Ken Griffin made headlines when he purchased a penthouse at 220 Central Park South for $238 million, making it the most expensive home in the country. He plans to use the home when he visits his New York office. This headline also caught the attention of City Council who started discussion on the Pied-a-terre tax once again. So, what is a Pied-a-terre and the proposed tax? A pied-a-terre is a part-time second home occupied for less than half of the year. Often times, it is an investment for the owner and may not be occupied. Given that the owner’s primary address is elsewhere, owners of a pied-a-terre in New York are not subject to state or local income tax. 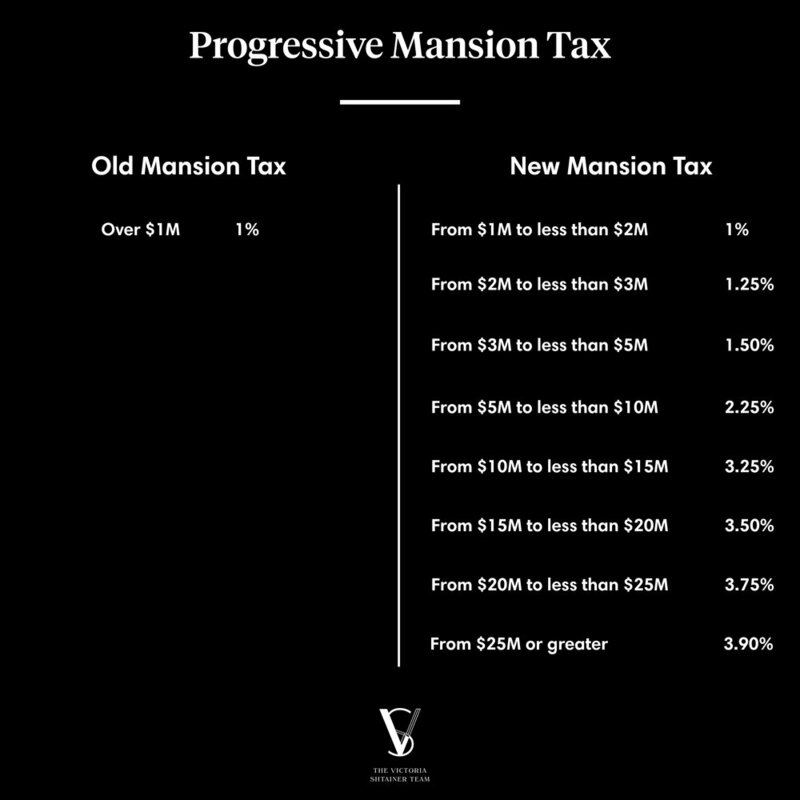 The current proposal has a sliding tax surcharge and fee for homes priced $5 million and over, with higher priced homes incurring higher fees. City and State officials cited that they feel this additional tax is necessary to fund the failing mass transit system in New York City. Regardless of whether you think it is fair to tax the rich disproportionately or not, a proposed tax plan should be assessed in regard to economic impact before being implemented. From a real estate perspective, there is cause for concern based on the proposal of a pied-a-terre tax in New York City. International Buyers: International Buyers have already been on the decline in recent years, and the implementation of a pied-a-terre tax would likely prevent some would-be foreign buyers from investing in New York. Luxury Condos and Co-Ops: We would likely expect to see some sort of downtick in the luxury segment of the market. Just because a buyer can afford a $5 million apartment, does not mean they spend frivolously and love taxes. Why would they invest in New York when they could invest in another viable city that does not impose a pied-a-terre tax? The luxury segment of the market has already been under pressure in recent years, so another tax could additional pressure that is not needed in this sector. New Development: An adverse impact on the Luxury Market would likely spill over to the New Development pipeline for luxury properties. If there is a decreased demand overall for properties $5 million and up, why would Developers be incentivized to build properties that may not sell? This, of course, would then have an impact on all the employment created within the construction sector when development is booming. High Costs to Transact: New York City is one of the most expensive places to transact on property without the additional pied-a-terre tax. Costs associated with a real estate transaction in New York City include Transfer Tax, State Transfer Tax, Mortgage Recording Tax, Mansion Tax, and Real Property Taxes. Not to mention, under the new Federal Tax Code, the deduction of SALT has been eliminated. Overall, if the tax were to have an adverse impact on the real estate market for properties $5 million and up, we would likely see a reduction in value at the high end of the market. This may especially may be the case for properties that are already valued/priced near the $5 million threshold as Buyers will submit bids under $5 million to avoid the tax. New year, new you? Whether you have grand ambitions for 2019 or just want to be a little more active, there’s an outdoor or active living option for you in New York City. From group fitness classes in the warmth and comfort of a studio to exercising while enjoying the city’s outdoor spaces, here’s some inspiration for making a fresh start with active living around New York in 2019. Plus, can’t get outside? Read down to find out about the buildings offering the best amenities for living an active lifestyle without having to leave home. Whether you’re already flexible or are wanting to become more so, there’s a yoga studio on practically every street corner in NYC. Meditative yoga, hot yoga, restorative yoga, laughter yoga, and naked yoga (yes, really) are just a few of the varieties you can check out. Plus, in the summer you can join an outdoor yoga class--strike a tree pose while being surrounded by the real thing. Bryant Park, Prospect Park, Astoria Park, and Hudson River Park offer large open spaces as well as beautiful views, and rooftop yoga is also an option. The great thing about yoga is that you can practice at home without any special equipment, so fitting active living into your daily routine is super easy. Kayaking or canoeing on the water is a great way to get in shape while admiring city skyline views. The New York City Water Trail links 160 square miles of waterways across New York’s boroughs, offering almost endless options for exploring. Plus, in the summer, some free kayaking and canoeing sessions are offered on the Hudson River, East River, and New York Harbor. You can hire kayaks/canoes and gear if you don’t have your own or want to see whether the sport is for you before making a larger investment. Kayaking and canoeing can be as solitary or sociable as you like, with tandem and single boats available, making it easy to combine your workout with an accountability buddy. While the dense urban environment of New York City might not seem to offer ideal cycling conditions, cycling is growing in popularity in the city. Many New Yorkers are now cycling to work, joining cycle clubs, and making use of bicycle sharing and hiring facilities. If zipping through the city traffic doesn’t appeal, Central Park and Prospect Park encourage cycling at the weekends by limiting or prohibiting motor vehicles, so you can enjoy a ride without the worry. Plus, you can always join a spinning studio for stationary cycle fun in conjunction with loud, up-tempo music. Expect to sweat. Hiking trails surrounded by nature may be closer to the central city than you think. Just an hour or two outside the city you can find woodland, rolling hills, streams, and lakes to explore. Bronx’s Pelham Bay Park, Arden Point-Hudson Highlands State Park, Staten Island’s Green Belt, and Franny Reese State Park are just a few of the easily accessible spots within a couple of hours of NYC that offer fun day hikes suitable for the whole family. To step up the activity level if you’re an experienced runner, try trail running. Some trails can be reached via public transport, while others do require your own set of wheels. New York is famous for its vibrant dance, from Broadway to Latin to hip hop to classical. Whether you dance like no one's watching or just want to try on some dancing shoes for a while, New York is the place to get active to the beat. For group dance classes in a gym setting, try Zumba. For something a little more risque but very good for your body, pole fitness will teach you some slinky moves. To combine dance moves with yoga and Pilates exercises, head to a barre studio. Plus, you can always practice what you learn in class during a night out on the town (go easy on the alcohol if you’re trying to get or stay in shape). If you have your own cross-country ski gear and there’s at least 6 inches of snow on the ground (which, let’s face it, is most winters now), head to Central Park to warm up. There’s flat and gentle hilly terrain that’s suitable for a range of levels of experience. The Sheep Meadow, Great Lawn, and North Meadow areas of the park are especially good for skiing. And of course, there are great cross-country skiing destinations a little further afield upstate, if you want to make a day or weekend trip of it. Rockland Lake State Park, Fahnestock State Park, and Minnewaska State Park Preserve are all fun destinations for cross-country skiing. 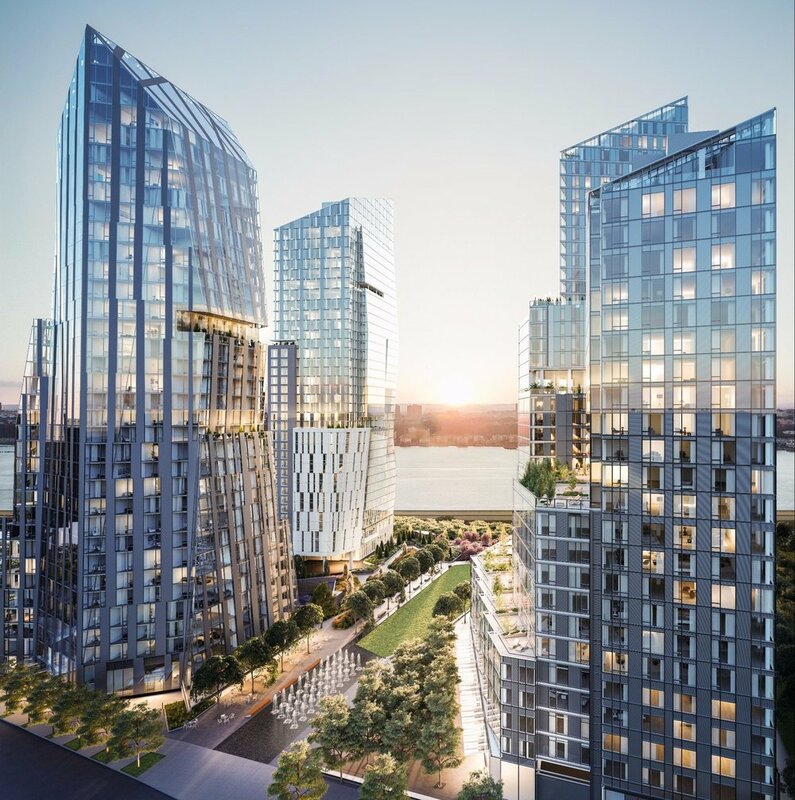 50 Riverside Boulevard is home to 50,000 square feet of lifestyle amenities by LA PALESTRA. 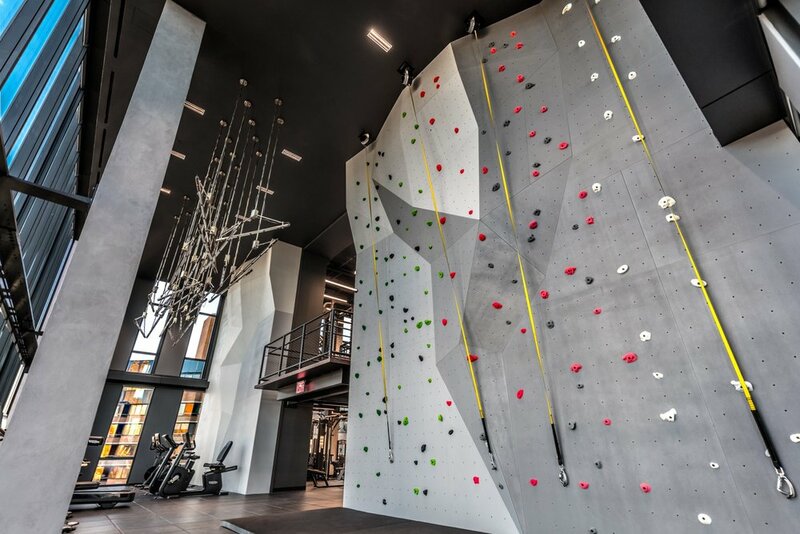 40,000 square feet of the amenities is the athletic and spa club which offers every activity you could imagine - swimming, rock climbing, gym, basketball, and 2 squash courts. No one does amenities quite like Extell Development. One Manhattan Square garnered attention when it was dubbed as a “City within a City” because of the very extensive amenity offering - spanning 100,000 square feet total! To stay active and healthy, One Manhattan Square will be offering residents a full size basketball court, fitness center, hammam with cold plunge, 75-ft 3 lane pool, and more. SHoP Architects has created a unique amenity space in the American Copper Building in the floating bridge that connects the two towers. Perhaps the most unique aspect? The pool that allows residents to swim from one tower to another 300 feet in the air. In addition to a pool, residents can enjoy a double-height fitness center, rock climbing, and a yoga studio. Interested in which Buildings will allow you to live the lifestyle that you enjoy? Contact Us! We know the best amenities around the City. As we enter a new year, we welcome new expectations for the housing market as we think about the year ahead. Briefly looking back at 2018, the year started off on a different note than it ended, namely rates rose to their highest levels in decades by year’s end, and the market fully transitioned to a Buyer’s Market. How do we expect 2019 to pan out? The year ahead is likely to be a bit tougher than 2018 and remain soft overall as a result of the Fed. Prices remaining at minimum stable would be a positive, and a small rate of price appreciation would be even better. When people see their home rise in value, they feel wealthier whereas declining home values can spark a feeling of an impending recession. Thinking about 2019, we identified 4 areas of focus 1) Interest Rates, 2) Millennials, 3) Inventory, and 4) Rentals. We anticipate that interest rates will continue to rise in 2019 given the strong economic fundamentals and low unemployment rate in the US economy. Rates may begin to approach levels that finally squeeze some folks out of the market and into a smaller home than originally planned. Rising rates may also encourage some would be “Trade Ups” to stay put. Increasing rates is likely to impact first-time buyers most heavily as increased rates means less buying power. From a larger, national housing market perspective, this could also contribute to slowing sales as Buyers grapples with higher mortgage rates and recent rapid price increases over the past few years. Millennials may be more at the forefront of the 2019 market than they were in 2018. This group could be a large driving force on the buy side of the market, especially for entry-level priced properties in New York City. The largest portion of Millennials will be ages 29-30 in 2019, a prime age for first-time homeownership. In a market such as New York, Millennials tend to be more affluent and savvy consumers, understanding the value in buying a property versus paying New York rent prices over the long term. Successful Millennials who have worked in industries such as Finance and Tech are likely armed with enough cash for a down payment. Studio-1-bedroom properties priced below $2M are appealing to this group of Buyers. Inventory is likely to remain elevated in NYC in 2019. New Developments continue to come to market and close, projects remain in the pipeline, and resale inventory will continue to come to market as well. This will be especially evident in the luxury sector of the market ($4M+) which has been experiencing a glut of inventory versus demand, a factor resulting in the shift to a Buyer’s Market. Average asking prices were inflated approximately 10% throughout 2018, and we expect the same to hold true throughout 2019. This means that Sellers had to take a significant reduction from Ask in order to get deals done. It is important to remember that deals get done when the price is right! Rent prices could likely see an uptick in 2019, attributed to the arrival of Amazon and increased demand. Amazon will bring with it a large number of high paying jobs, and thus increased demand from their employees as well as peripheral interest generated when a company such as Amazon picks a city as their home base. Google has also been discussing bringing a large number of net new jobs to NYC. Whether we see an increase in rent asking prices with concessions available or the dropping of concessions with asking prices remaining consistent resulting in a net effective increase in rent remains to be seen. We feel the latter is a probable scenario as landlords tend to drop concessions with demands increases as there is more competition for units. Additional rental inventory is something to watch in 2019 as it relates to pricing as this could be a factor that keeps a lid on rising rental prices. Amazon made a big announcement this week, officially stating they New York City would be one of two locations for their HQ2, naming Long Island City as the location. When headlines broke, everyone in the real estate industry began thinking – how will this impact NYC real estate, particularly Long Island City? The arrival of Amazon will continue the development of Long Island City and should encourage the city to invest dollars into infrastructure such as the subway system which is in dire need and buses. With the arrival of the new Amazon headquarters comes and anticipated 25,000 new, high earning employees. Long Island City has had a housing development boom in recent years with the neighborhood continually becoming more residential and less industrial. We continue to expect new units to come to market in the neighborhood in the near term. Prices have been on the up, and in fact, LIC is the priciest neighborhood within Queens. Amazon’s announcement means there will be inherent increased interest in the neighborhood which could push prices slightly higher rather quickly, especially in terms of rent demand. It is important to note that rents in LIC luxury brands somewhat mirror that of Manhattan rents, so prices may not skyrocket in the short term, however, increased demand may motivate landlords to remove concessions that are being found on many luxury rentals. There has been an absorption issue in Long Island City given the sheer amount of inventory that has come on the market in the neighborhood in recent years. Anticipate price impacts to be felt in other neighborhoods as well. The influx of employees may look to other neighborhoods that still allow for easy access to LIC such as Midtown East and the Upper East Side where they may find more bang for their buck. Being priced out of the market is still a very large issue for the NYC housing market as wages cannot keep up with cost of living for many. Because of that, we expect that the largest increase in pricing may be seen in peripheral neighborhoods that are still up and coming such as Greenpoint, Brooklyn. A new influx of residents in neighborhoods such as this could push pricing higher. While Amazon is garnering much press and attention about the location of their second US headquarters, it is important to remember that there are other plays that can contribute to this as well. Google has stated they expect to nearly double their workforce in coming years. The arrival of Amazon could further establish New York as a tech center and attract everything from Amazon competitors to start ups. What does that mean? The influx of people as a result of high paying jobs could be greater than what will be from Amazon on its own. Have you been considering investing in real estate? Headlines and news stories may have some home owners concerned about their property purchase, or investors second guessing a decision to invest in Manhattan real estate. Like any investing, it is important to take a disciplined approach to investing in real estate guided by the advice of an expert. Analysis of over a decade of Manhattan housing data exhibited the strength of the borough to remain a sound investment compared to many of the global markets out there. So, is all of Manhattan the same? Considering the following things when approaching Manhattan Real Estate from an investment standpoint. Manhattan is somewhat a world of its own when it comes to the market and its driving factors in comparison to the larger macroeconomic landscape. The Manhattan market moves at its own pace during economic downturns as a result. We, of course, observed a large anomaly to this during the Global Financial Crisis of 2008. The crisis took down the entire global economy and impacted Manhattan housing. However, recovery in Manhattan was much quicker than that of other global centers. During this crisis time, Entry-level luxury bounced back most rapidly. UBS Wealth Management publishes a Global Real Estate Bubble Index annually, and New York City was rated “fair value,” especially in comparison to hot markets such as San Francisco, Hong Kong, and Toronto. We have talked about entry-level price points as being key in the current market throughout many issues of Victoria’s View. In the case of Manhattan, some could argue that entry-level pricing could stretch as far as $5-6M. These are the properties that have shown exceptional price resilience over recent years in a market that some argue is slow. Sub $3M has been especially busy the last few years. Open houses are getting a lot of foot traffic at this price point, and some properties are even experiencing bidding wars, especially those priced in the $1M range. Why has entry level luxury faired so well? Demand is strongest at this price point in Manhattan. At this price, demand is fueled by working urbanites that are looking for their first-time home purchase, or are, perhaps, upgrading from a 1 bedroom to a 2 or 3 bedroom as they start a family. Compared to ultra-luxury, or properties priced $10M+, entry-level luxury in Manhattan has remained more stable, largely a result of this demand from working professionals who need a place to live that we just discussed. Entry-level luxury likely has a higher buyer based composed of individuals seeking their primary residences rather than a second or third home which is often the case with buyers at ultra-luxury price points. When you invest in stocks, you assess funds/companies/ETFs that match your identified risk profile. Risk may be assessed on things such as sector – Utilities may be considered more risk averse and less prone to price swings than a sector such as Biotech. So, when thinking about real estate, what factors should you use to assess risk and volatility when considering your investment? Bedroom count plays a big part of real estate price movement. As a result, bedroom count can be a contributing factor to price volatility of real estate assets. One and Two-bedroom apartments are more common while 4+ bedroom apartments and large townhomes are more unique and rare, thus there is an inherent pricing question when it comes to large apartments as there is simply less historical data and comparables to which to defer. While more bedrooms may mean more risk, more risk is often associated with the possibility of more reward. Prices of large apartments have risen dramatically since the 1980s and 1990s, however, in similar fashion, they were largely impacted during the great recession with pricing on large properties still under pressure. Pricing on one-bedroom properties have recovered from recession lows, largely fueled by the consistent demand in this space. Just as a company or stock has intrinsic value, so, too, does real estate. When considering investing in real estate, partner with your broker so you can identify properties that have more intrinsic value than others. Neighborhood Stature – are there good schools nearby? Is the area established, up-and-coming, or on a decline? There are additional ways to squeeze a bit more rent out of your unit and also have an increased likelihood to win over a prospective tenant as they are shopping around. While some of them are an expense upfront, they are some of the most common requests we see from prospective renters. Thus, you will most likely recoup the cost of these investments into your property. Hiring a broker will be crucial to maximize the rent received. They are able to position your apartment on the market to appeal to the right audience and spend the time to understand the intricacies of the board package and fees. Price correctly! Rely on your broker’s expertise to price correctly so you can rent sooner rather than later.